Bank Note Press Dewas Recruitment 2018 - Apply Online for 86 Junior Technician, Supervisor & Other Posts in Bank Note Press Dewas, New Delhi. Online Applications are invited by Bank Note Press, Dewas (Madhya Pradesh) from 13 Oct 2018 to 09 Nov 2018 for 86 vacancies. Bank Note Press Dewas Junior Technician, Safety Officer & Other Post Result with Marks 2019: Bank Note Press, Dewas (Madhya Pradesh) has announced the Result on 04 Feb 2019 for Bank Note Press Junior Technician, Safety Officer & Other Post Exam 2018 which was conducted on 16 Dec 2018. 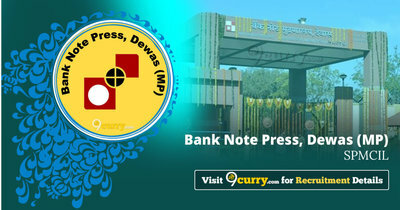 Bank Note Press Dewas Various Post Admit Card 2018: Bank Note Press, Dewas (Madhya Pradesh) has issued the Admit Card on 29 Nov 2018 for Bank Note Press Various Post Exam 2018 which is scheduled to be held on 16 Dec 2018. Minimum- 18 years as on 09 Nov 2018. 01 i) Possesses recognized degree in any branch of Engineering or Technology and has had practical experience of working in a Factory in a supervisory capacity for a period of not less than 2 years. ii) Possess a Degree or Diploma in Industrial Safety recognized by the State Government in this behalf. iii) Has adequate knowledge of Hindi as also of the language spoken by the majority or the workers in the factory to which he is to be attached. 15 1st class Diploma in Printing Technology from AICTE approved Institute. 01 1st class Diploma in Electrical/ Electronics from AICTE approved Institute. 01 1st class Diploma in IT/ Computer Engineering from AICTE approved Institute. 02 1st class Diploma in Air-Conditioning/Refrigeration Engineering from AICTE approved Institute. 03 1st class Diploma in Civil Engineering from AICTE approved Institute. 05 1st class Diploma in dyestuff technology/ paint technology/ surface coating technology/ printing ink technology/ printing technology from AICTE approved Institute. 18 Graduate with at least 55% marks and computer knowledge with typing speed in English @40 wpm / Hindi @30 wpm. 30 Full-time ITI certificate in dyestuff technology/ paint technology/ surface coating technology/ printing ink technology/ printing technology. 09 Full-time ITI certificate in Printing & Platemaking Trade viz. Litho Offset Machine Minder, Letter Press Machine Minder, Offset Printing, Platemaking, Electroplating, Hand Composing. On the basis of Skill Test, Online Test & Typing Test and Interview. Eligible candidates may apply online at Bank Note Press Dewas's website (direct link is given below) from 13 Oct 2018 to 09 Nov 2018. Candidates log on to https://bnpdewas.spmcil.com/.